So being a Quant Finance student I constantly get exposed to different types of derivatives etc. And being the “trend following” guy that I am, I’m always interested in looking at the price of something over time, simply to check if there’s any “obvious” trends I can spot. So U.S. Treasury bills/notes was one of these instruments, and I quickly got the feeling that most of the people around me were mostly interested in the current yield curve. 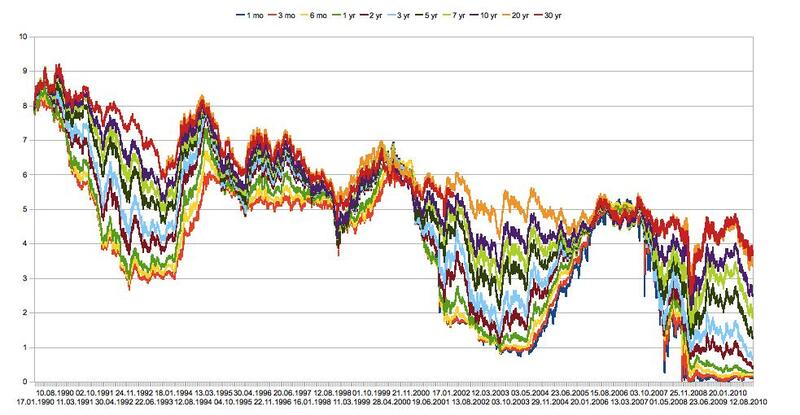 But what about the historical yield curve? So I found some data on this website, ranging from 1990 till now, and started playing around with it in my spreadsheet application. Even if you click on it to enlarge it, it’s still a bit messy. But non the less, you can clearly tell that the spread between long term and short term several times go from being more or less equal to increasing then decreasing in size. Now I would strongly argue that you’re able to see some long term trends in this chart, in addition to some sideways moving channels between about 1994/95 and 99, in addition to the last year or two. Quite interesting, I would say..